Desarrollado por la empresa Krupp entre 1943 y 1944. Un modelo de la artillería se construyó, sin embargo, ningún prototipo llegó a producirse. It is a good artillery for its tier, with the widest (along with the M37) gun traverse arc of any artillery thanks to its limited turret rotation - making it easy to move to new targets without having to move the hull of your tank. The GW Panther starts with the Hummel's gun, but gets a more accurate and powerful gun once researched. 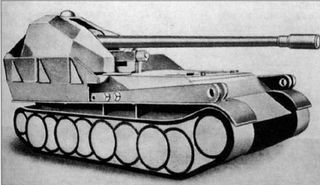 The GW Panther cannot excel in the role of a tank destroyer, as the Hummel did due to its size and lack of gun depression, but it can do the job in an emergency. The GW Panther is highly maneuverable for a tier 7 SPG, which allows easy relocation in the event of detection. It is nicknamed "Dracula", due to its Dracula cape-like armor on the rear and side of its gun. Now slow hull traverse speed, along with the Hummel in 8.6. The GW Panther is a very solid arty, having a high accuracy and a large firing arc; and these days with the raised dispersion while moving (since 8.6), a large firing arc is very important. This also works well with the camouflage net, as it stays active in critical situations. Therefore, if any enemies come near, you have the element of surprise. The high accuracy (0,70, the best of any german SPG), a good firing arc and high damage amkes the G.W. Panther one of the most feared SPGs in the game.